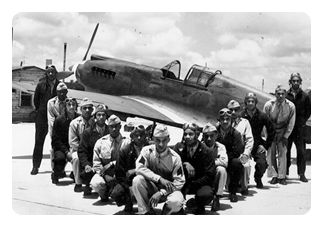 The Tuskegee Airmen flew into the history books during World War II. They were pioneers in the integration of the armed forces. During WWII, the U.S. military was racially segregated. Most black service members were restricted to labor battalions and other support positions. The United States Army Air Forces (USAAF) launched an “experiment” to give blacks an opportunity to train to become pilots and leaders. The airmen received primary training at Moton Field (Tuskegee University) and basic, advanced, and transitional training at Tuskegee Army Air Field. The USAAF built special facilities for the future pilots. They trained in the heart of the segregated South in the teeth of the Jim Crow era. When they left base, they were restricted to the laws of segregation; yet each volunteered to serve his country to defeat the forces of Fascism. Despite the hardships of dealing with crowded classrooms and some racist instructors, the black fliers became some of the most decorated pilots in the USAAF. They became known as the Tuskegee Airmen, a title that has been given to all of the over 14 thousand participants who were trained or worked in the program at Tuskegee. Their ranks included pilots, bombardiers, navigators, doctors, nurses, mechanics, weathermen, parachute riggers, and other support personnel. The Tuskegee Airmen were known for their courage under fire. While they could not train alongside their white counterparts, the black pilots were nicknamed “Red Tail Angels” because of the protection that they provided as escorts on bombing missions. The first class completed training in March 1942. From that date until 1946, 992 pilots graduated from Tuskegee Army Air Field. Of these, 450 pilots served overseas in either the 99th Pursuit Squadron or the 332nd Fighter Group. The first class included George Roberts, Benjamin Davis Jr., Charles BeBow Jr., Mac Ross, and Lemuel Curtis. Captain Benjamin O. Davis Jr., was a 1936 West Point graduate. As a Colonel, Davis was the first black officer to command the 332nd. He later rose to the rank of Lt. General and in retirement was awarded a fourth star by President Clinton in 1993. The airmen amassed an impressive military record. They flew 1578 missions for the 15th and 12th Air Forces during WWII, and destroyed or damaged more than 400 enemy aircraft, 950 ground units, and sank a destroyer. Sixty six pilots lost their lives in combat. The pilots also earned numerous honors for their courageous efforts: 96 Distinguished Flying Crosses, 8 Purple Hearts, 14 Bronze Stars, 744 Air Medals and Clusters, and 3 Distinguished Unit citations. Over the years, the Tuskegee Airmen have become legends. They have been honored by United States Presidents and in 2007 the airmen were presented the Congressional Gold Medal for service during WWII. Their story has been told in numerous publications, and in movies and documentaries.